Movies love to depict our fear of science, a trend that dates back to Edison’s 1910 rendition of Frankenstein. But the real frenzy came with the onset of the atomic age. Among the countless “creature features” spawned by our global fear of the destruction science had wrought, Godzilla reigned supreme. Ishiro Honda’s Hiroshima analogy simultaneously entertained and terrified as it tapped our horrified fascination with the destruction, once unthinkable, that was suddenly an ever-present danger. Back in 2010, visual effects maestro Gareth Edwards tread similar ground of societal guilt, dread and terror with his underseen alien flick Monsters. More than anything, though, that film clarified his aptitude for creature action, a talent that serves him well for his Godzilla reboot. He’s assembled a phenomenal cast for the monster mash up, though I’m not sure why. Award-winning actors Ken Watanabe, Bryan Cranston, Elizabeth Olsen, Sally Hawkins, David Strathairn, Juliette Binoche and Aaron Taylor-Johnson appear onscreen (and do little else) as we wait for the epic battle between Godzilla and two new creatures with a taste for radiation. Taylor-Johnson is a military bomb defusing expert who leaves his wife (Olsen) and their son behind in San Francisco to fly to Japan to bail his crazy scientist/grieving widower father (Cranston) out of jail. He’d been caught trespassing on a site quarantined for 14 years – ever since the nuclear reactor disaster that killed his wife. Well, there’s more to that story than meets the eye. The talent-laden cast doesn’t get the opportunity to flesh out their characters, so there’s little human drama to cling to as chaos approaches. Perhaps even more damaging, Max Borenstein and Dave Callaham’s screenplay fails to truly lay blame for this behemoth blood match on mankind. Flaws aside, Godzilla delivers the creature feature goods. Few summer blockbusters contain such gloriously realized action sequences, gorgeously framed images of disarray, or thrillingly articulated beasts. Edwards never hides his inspiration (the lead’s name is Brody, for God’s sake). 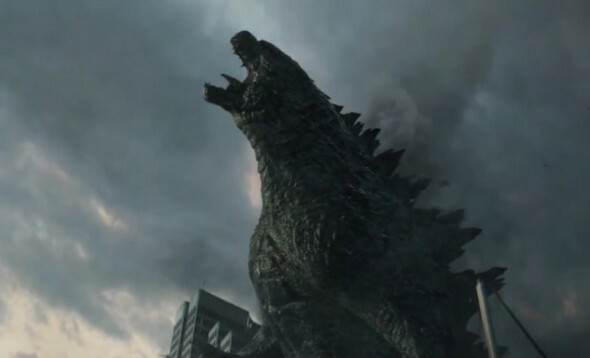 While he draws from Jaws, Aliens, Close Encounters, Rise of the Planet of the Apes and any number of previous Godzilla efforts, the amalgam is purely his own. This is an easy franchise to take in the wrong direction. Who remembers Godzuki? But Edwards brings a competent hand and reverent tone to breathe new life into the old dinosaur.